People who are starting cannabis farms and opening dispensaries now, in the early years of legal recreational cannabis, are actually pioneers whose stories will likely go down in Oregon history along with the brave wagon train trailblazers and early loggers, fruit growers and vintners. If you ask them, they’ll probably be glad to fill your ear with stories about cruel jail sentences and painful physical problems that were endured before society said, hey, this stuff ain’t hurtin’ anyone and might help. Not untypical are Lillian and Alex Whitnell, a married couple of 20-somethings who pioneered west from Illinois to create Madrone Cannabis Club, a seed-to-sale dispensary near the Ashland airport with an all-outdoor grow in the Applegate near Murphy. What makes the story captivating is that in her mid-teens she was a horsewoman, which she loved, but unfortunately she got a bad back injury, with lots of pain, despite muscle relaxants, hydrocodone and other things that aren’t exactly good for you and didn’t make the pain stop. Then came cannabis, in topical form. Again, cannabis worked. “He likes the prerolls, old-school style,” she says. After a stop in Boulder they opened for business three years ago in Southern Oregon. There are six partners, three of them in the shop, with up to 20 employees at peak times. They’re all big believers in natural, outdoor product, because it’s good for the environment and more energy efficient, she says. 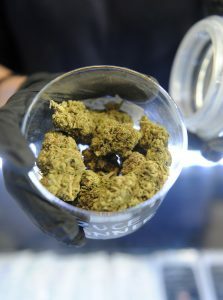 Business is good, in large part because “the whole new market of recreational is much in demand for recently retired baby boomers, to take care of their aches and pains,” she notes. It’s a huge new industry, and there’s lots of education for both sellers and buyers, she says. One advance is that buyers no longer cling to the idea that CBD is for medicinal uses and THC for recreational purposes. Eating pot has lost its risky edge, she adds, because strength and dosage are now tightly regulated and brought in uniform packaging where you can discern easy-to-handle 5 mg doses. Like just about everyone in the new recreational business, the Whitnells want to create a good reputation, be good neighbors, help the economy and contribute to charitable community causes, including volunteering for dog-wash days at the Humane Society. They also “give back” via Freedom Grow, whose motto is “Helping People in Prison for Non-Violent Cannabis Crimes.” One Oregon man they are helping recently got eight years for having “his medicine” with him in Mississippi. The shop’s location, near big hotels and the freeway, ensure good traffic — and it’s on an out-of-the-way cul-de-sac on the fringe of town, which is a boon for respectable professionals who are regular customers but aren’t too crazy about pulling up and getting out of their car and walking in a pot shop on the main drag, she says. Lillian Whitnell shows her favorite choice of flower, Bruce Manner, sold at Madrone Cannabis Club in Ashland. 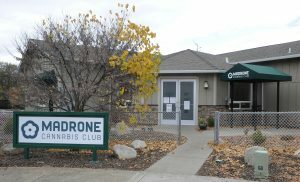 Madrone Cannabis Club is near the airport in Ashland.